Eco R Geo: Bohrinsel-Angriff: Greenpeace-Aktivisten in Russland unter Piraterie-Verdacht. Am Mittwochabend hatten Greenpeace-Aktivisten versucht, die Bohrinsel „Priraslomnaja“ in der Petschora-See, einem Randmeer der arktischen Barentssee, zu erklimmen, um die Förderarbeiten zu stören. Das Personal der Bohrinsel löste Terroralarm aus. Nach Angaben des russischen Küstenschutzes wurden die Aktivisten vom Eisbrecher „Arctic Sunrise“ abgesetzt und erreichten mit fünf Schnellbooten die Bohrinsel. Auf einem der Boote habe sich ein „nicht identifizierter und wie eine Bombe aussehender Gegenstand“ befunden. Weil die „Arctic Sunrise“ nicht auf Warnschüsse reagierte, musste das Schiff aufgebracht werden. Derzeit wird es zur Ermittlungen nach Murmansk abgeschleppt. Zudem wurden zwei mit Bergsteigerausrüstung ausgestattete „Alpinisten“ festgenommen. Bei ihnen handelt es sich laut Greenpeace um die Finnin Sini Saarela und den Schweizer Marco Polo. Bereits im August 2012 hatten sechs Greenpeace-„Alpinisten“ für 15 Stunden „Priraslomnaja“ besetzt. Die Bohrinsel wird vom russischen Staatsunternehmen Gazprom Neft Schelf betrieben. Así lo informó la filial de la ONG en Argentina. El barco en el que están es remolcado hacia el puerto de Murmansk. Podrían acusarlos de terrorismo. Greenpeace Argentina emitió un comunicado en el cual informa que los activistas argentinos y toda la tripulación del rompehielos de Greenpeace Arctic Sunrise “permanecen bajo la custodia de las autoridades rusas desde hace más de 24 horas”, cuando fueron abordados mientras protestaban contra la exploración petrolera en el Artico. La ONG también señala que el Consulado Argentino en Moscú pidió información al Gobierno ruso acerca de la situación de los activistas detenidos y “pudo confirmar que el barco de Greenpeace está siendo remolcado al puerto de Murmansk. La fecha de arribo estimada es el próximo lunes”. Además, afirma el comunicado, la Cancillería argentina, a través de la Dirección de Argentinos en el Exterior, estuvo en contacto desde un primer momento con directivos de Greenpeace en Argentina y Rusia, y con los familiares de los dos argentinos detenidos. MOSCOW, September 24. (Itar-Tass) – Russian authorities have opened a criminal case over Greenpeace activists trying to board the Prirazlomnaya oil platform, Vladimir Markin, representative of Russia’s Investigative Committee, told Itar-Tass. “After conducting the pre-trial investigation, Russia’s North-West Federal District branch of the Investigative Committee has opened a criminal case based on part 3 of the article 227 of Russia’s Criminal Code – Piracy, conducted by an organized group,” Markin said. Investigators plan to prosecute all activists of the organization who participated in the attack, regardless of their citizenship. “All investigative activity will be conducted with strict accordance to Russian legislation and international law,” the official emphasized. "If a foreign ship has plenty of technical equipment on board purposes of which is unknown, and a group of persons, who proclaimed themselves to be representatives of the ecological rights organization, actually attempt to seize an oil platform by force, a logical question arises as to what their intentions really are. The question is quite justified because one can hardly believe that the so called "environmental activists" did not know that an oil derrick on board the platform is an object posing a particular threat, and that any unauthorized activity there is fraught with an accident,” Markin said. "An accident if provoked might have posed a threat not only to the people who are working on the platform, but also to those who so ferociously defend the environment. Anyway, such activities not only infringe on the sovereignty of a state, but might pose a threat to the environmental security of whole region," Markin said. The incident happened September 18. According to the investigation, “a group of individuals with ties to the ecological rights organization Greenpeace, tried to board the platform from the ‘Arctic Sunrise’ vessel. This even was prevented by border patrol. As the vessel was flying the flag of Netherlands, the country’s Foreign Ministry declared it would request an explanation from Russian authorities.” The watercraft was subsequently boarded by Russian law enforcements. Las autoridades rusas han abierto una investigación "por piratería" contra activistas de Greenpeace, independientemente de su nacionalidad, por una acción de la organización ecologista cometida contra una plataforma petrolífera de la empresa Gazprom en el Ártico, según ha anunciado este martes el Comité de Investigación ruso. "Después de las verificaciones (...) se ha abierto una investigación penal en virtud del artículo 227 parte 3 del Código Penal ruso (piratería en grupo organizada)", ha indicado el Comité en un comunicado y ha precisado que los implicados serán procesados "con independencia de su nacionalidad". Greenpeace anunció el viernes de la semana pasada una convocatoria de protesta en todo el mundo para exigir la liberación de su rompehielos Arctic Sunrise con 25 activistas a bordo, detenido el jueves en el Ártico por guardias fronterizos rusos. "Hemos llamado a todas nuestras oficinas a sumarse a la protesta contra la detención del barco. Las delegaciones en Finlandia, Suiza y Alemania ya han confirmado que participarán", explicó la coordinadora del programa ártico de la organización, Yevguenia Beliakova. Greenpeace afirma que la plataforma Prirazlómnaya de Gazprom se encuentra en un estado técnico "amenazante al ecosistema ártico" y que fue puesta en marcha "con un gran número de fallos técnicos y sin un plan de liquidación de fugas". La guardia de fronteras rusa abrió fuego de advertencia contra el Arctic Sunrise después de que los activistas partiesen del rompehielos en lanchas neumáticas hacia la plataforma para atarse a ella en protesta contra la exploración de petróleo. Las imágenes distribuidas por Greenpeace muestran cómo los guardias costeros apuntaron a los activistas con sus armas. Un tribunal de la ville russe de Mourmansk (nord) a placé en détention provisoire un militant de Greenpeace et un photojournaliste interpellés dans le cadre de l'affaire Arctic Sunrise, rapporte jeudi le correspondant de RIA Novosti sur place. Conformément à la décision du tribunal, le militant de Greenpeace Roman Dolgov et le photographe Denis Siniakov resteront en détention au moins jusqu'au 24 novembre. Des militants de Greenpeace, qui se trouvaient à bord du brise-glace Arctic Sunrise battant pavillon néerlandais, ont essayé le 18 septembre dernier d'escalader la plateforme pétrolière Prirazlomnaïa de Gazprom, en mer de Petchora. Les gardes-frontières russes ont effectué des tirs de sommation pour contraindre le capitaine de l'Arctic Sunrise à couper ses moteurs. Suite au refus du capitaine, les gardes-frontières ont pris jeudi soir le contrôle du brise-glace via un hélicoptère. Mardi 24 septembre, l'Arctique Sunrise a été remorqué dans le port de Mourmansk, où les membres de l'équipage, une trentaine d'écologistes originaires de 16 pays, ont été interpellés. Le Comité d'enquête russe a engagé à leur encontre une enquête pour "piraterie". MOSCOW, September 28 (RIA Novosti) – Russia's investigators started Saturday inspecting the Greenpeace ship seized in the Arctic by the country's authorities last week, a spokesman for the Russian Investigative Committee has said. “The investigators have received a warrant from a court to inspect the ship,” a spokesman said. 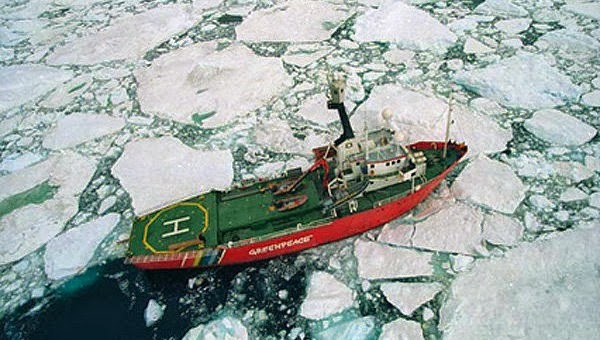 Greenpeace said earlier Russian investigators boarded the vessel, Arctic Sunrise, on Saturday morning. The captain of the ship, Peter Willcox, and his lawyer are present for the inspection. A Russian court ruled to put a group of 22 foreign and Russian Greenpeace activists behind bars for two months Thursday over their protest at an offshore oil drilling platform in the Arctic last week. Eight others are being held for three days awaiting a new hearing, the environmental group said. Thirty people of 19 different nationalities were detained when Russian border guards stormed the Greenpeace icebreaker Arctic Sunrise on September 19, a day after two activists scaled a Russian oil rig in the Pechora Sea to protest against the potential impact of drilling on the Arctic’s fragile ecosystem. They are now under investigation for piracy, which carries a maximum jail sentence in Russia of 15 years. No charges have yet been brought in the case. Russian President Vladimir Putin said Wednesday that the actions of the Greenpeace activists clearly did not amount to piracy, but that they were illegal. MOSCOW, October 2 (RIA Novosti) – Russian investigators on Wednesday started charging a group of environmental activists detained aboard a Greenpeace icebreaker during their protest at an offshore oil rig in the Arctic last month, with at least 14 of the detainees formally charged with piracy, Greenpeace said. All 30 people detained from the Arctic Sunrise ship – from 18 countries – have been placed in jail for two months to await court hearings after investigators opened a criminal case on piracy charges related to the September 18 incident, in which some of the activists tried to scale the Russian oil rig in international waters in the Pechora Sea. A British freelance videographer and activists from Brazil, Britain, Poland and Ukraine were among the 14 charged with piracy, Greenpeace said Wednesday. The group's lawyers said they are planning to appeal. “Today, the investigation has begun the process of bringing charges against the suspects over the case into the attack on the Prirazlomnaya oil rig,” an Investigative Committee spokesperson said Wednesday, but did not clarify what the charges were or who was involved. The piracy charges cited in the original case carry a maximum punishment of up to 15 years in prison. Argentina’s Foreign Minister Hectór Timerman said he is planning to appeal to the Russian authorities to transfer the detained activists to house arrest under “state guarantees,” the country's Infobae online newspaper reported Tuesday. Previous media reports said the Arctic Sunrise’s crew included at least two Argentinian nationals. The NGO’s representatives have insisted that the Arctic Sunrise’s action was a peaceful and legal protest against oil drilling in the area.